A species of fish has been found to have touch-sensitive fins, along with cellular structures resembling those that are key to the sense of touch in mammals. 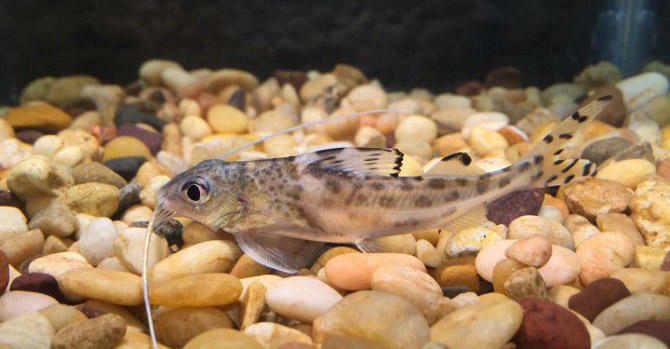 University of Chicago (UC) scientists, in a paper published Feb. 10 in the journal Proceedings of the Royal Society B, have found that the pictus catfish, a bottom-dweller from the Amazon River, has neurons and cells in its pectoral fins (the ones just behind the gills) that are extremely sensitive to touch. "It was a surprise to us that, similar to mammalian skin, fish fins are able to sense light pressure and subtle motion," said UC graduate student Adam Hardy, an author of the study. Using the flat end of a pin, and a brush, Hardy and his team stimulated the fish's pectoral fins and then measured the resulting neural activity. They found that the fish's neurons responded to more than just the touch itself: They also conveyed information about the pressure being applied as well as the motion of the brush. Meanwhile, cell structures in the pectoral fins, the scientists learned, resembled those that are crucial to sense of touch in mammals. "Like us, fish are able to feel the environment around them with their fins," said UC graduate mentor Melina Hale. "Touch sensation may allow fish to live in dim environments, using touch to navigate when vision is limited." "It raises a lot of exciting questions," she added, "on how sensory cells shape the brain's perception of environmental features, and may provide insight into the evolution of sensation in vertebrates." Furthermore, the researchers think this sense of touch is quite common among sea-floor fish. "We suggest that touch-sensitive fins may be widespread in fishes that maintain a close association with the bottom substrate," they wrote. Currently, the team is experimenting with other species of fish, to see if the same touch-sensitivity is present. "We predicted that touch-sensitive fins would be very useful for bottom-dwelling fish," Hardy said, "but you can imagine its utility in nocturnal or deep-sea environments as well." The researchers think the new findings could also aid in the design of future undersea robots that toil in dark environments. "For example," offered Hale, "you can envision fish-inspired sensory membranes that can be used to scan surfaces in underwater environments where light may be obscured."